﻿Meet face to face with the industry professionals and get answers to all the questions you had! "Meet an Advisor" is a speed networking event, in which professionals from a variety of industries will meet with students in a one-on-one session to explore career-related topics, discuss industry trends, critique resume and provide interview tips. This event is a great opportunity to network with professionals from well-known companies and be ready for the OCR interviews. Companies that will be present are Ernst & Young, KPMG, Colgate-Palmolive, Moody's, Cantor Fitzgerald, Interbrand, Grant Thorton, IgnitionOne, Deloitte and more! 9.00 AM to 10.30 AM - 6 rounds of 15 minute One-on-One mentoring session. 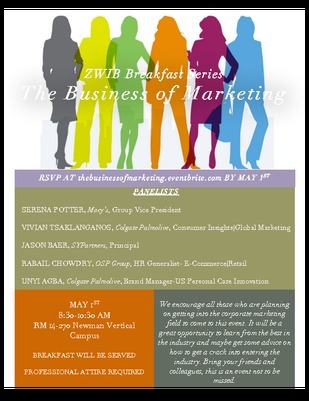 On May 1st, ZWIB club will organize "The Business of Marketing" event with various panelists listed below. 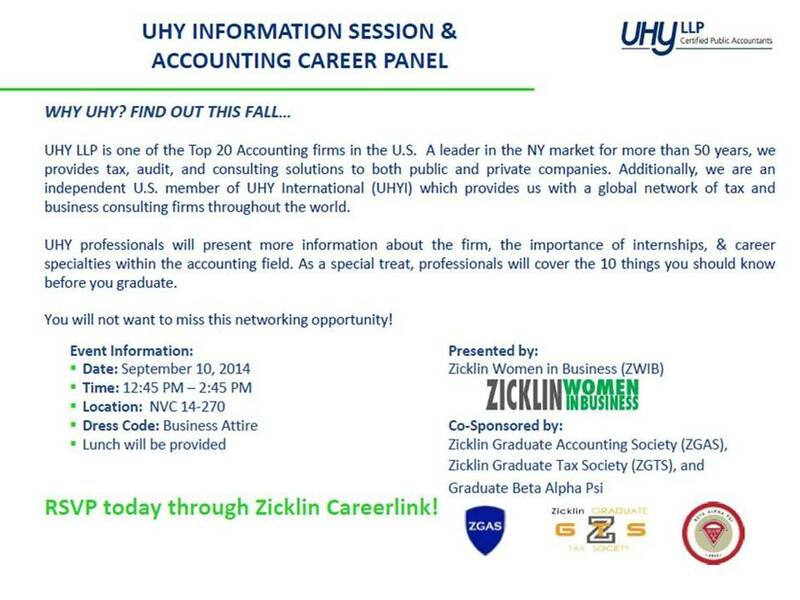 We encourage all those who are planning on getting into the corporate marketing field to come to this event. It will be a great opportunity to learn from the best in the industry and maybe get some advice on how to get a crack into entering the industry. Bring your friends and colleagues, this is an event not to be missed. 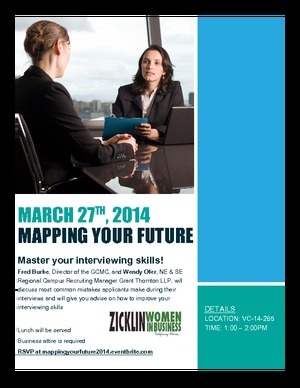 On March 27th, ZWIB club will organize "Mapping Your Future" event with Fred Burke, Director of GCMC, and Wendy Ofer, NE & SE Regional Campus Recruiting Manager Grant Thornton. Fred Burke, Director of the GCMC, and Wendy Ofer, NE & SE Regional Campus Recruiting Manager Grant Thornton LLP, will discuss most common mistakes applicants make during their interviews and will give you advice on how to improve your interviewing skills. The Second EOC JobSmart Career Hour- Stand Out: Building your Personal Brand is on Tuesday, March 18th from 12:45 to 2:00 pm at NVC 14-245. 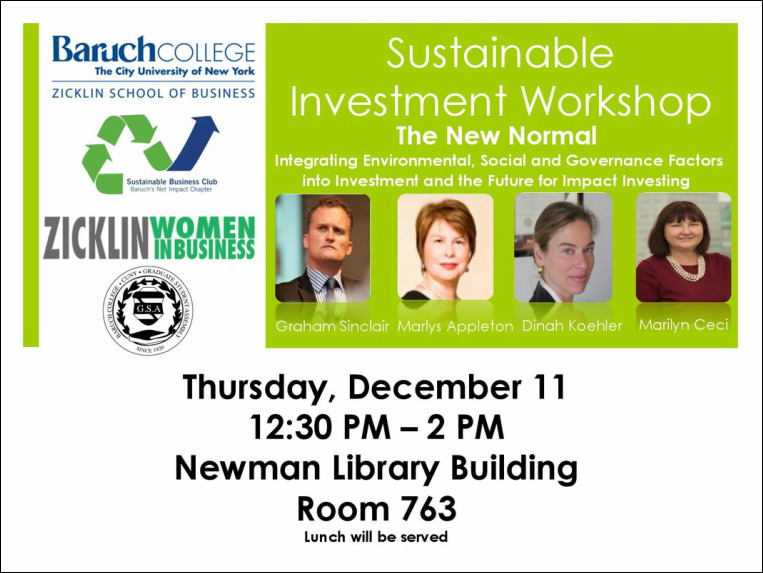 ZWIB is cosponsoring the event. 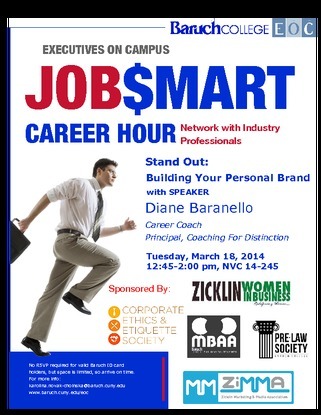 The speaker is Diane Baranello, a former global Training Director for The Citigroup Private Bank. We hope you can join us at the event as she talks about how to be in command of our personal brand. If you would like further details about Ms. Baranello, please click here for more details. holders, but space is limited, so arrive on time. 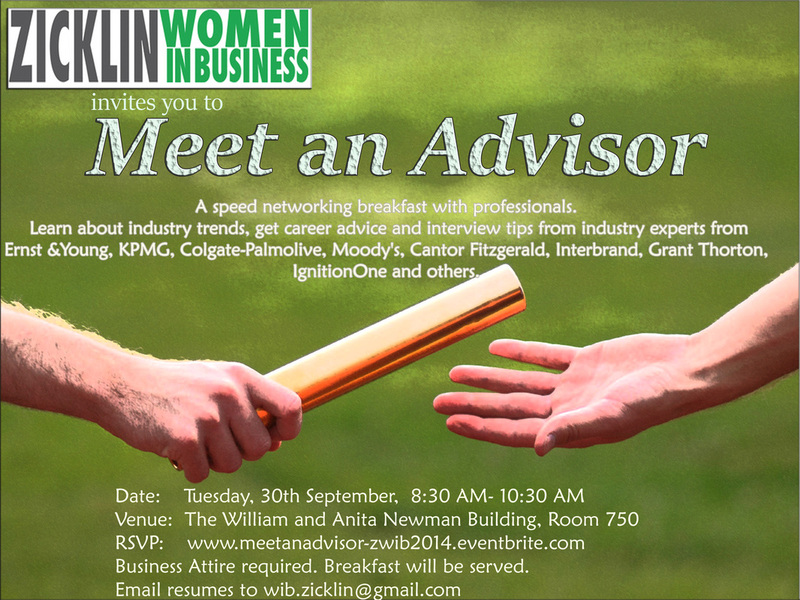 Please join ZWIB member Cynthia Balli host the first Women in Business Be Bold Salon. A Be Bold Salon is a brunch with a purpose! Plan to sip mimosas and discuss what we can all do to take our careers to the next level, whether that's speaking up in meetings, preparing for a negotiation, or pushing for a promotion. 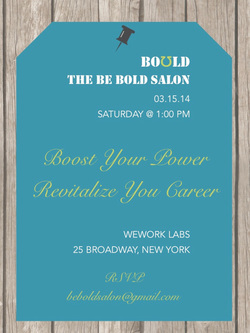 Capped at 10 women, a Be Bold Salon will help you address your professional needs in a fun, relaxed setting. Be Bold Salons were designed by Boʊld. Boʊld provides a suite of one-on-one career sponsoring services to help millennials meet their career goals. Launched by Baruch students, Boʊld is currently testing a business model with the goal of reinventing career planning. You can come with a friend (please register) + event is also open to non-Baruch students! 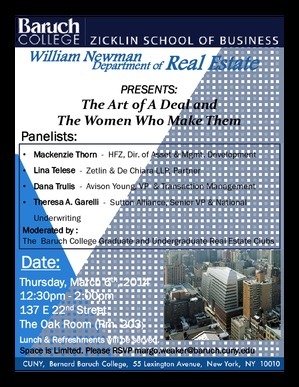 If you are interested in the Real Estate Industry, don't miss out on this great event moderated by the Baruch College Graduate and Undergraduate Real Estate Clubs. **Lunch and Refreshments will be served! 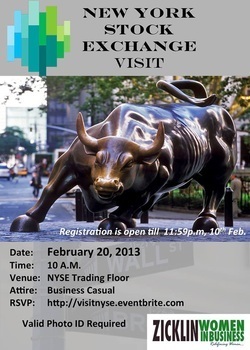 Join us for an exhilariting and educational tour of the legendary New York Stock Exchange. Hurry! Limited seats available! We are happy to announce all the tickets have been sold out. Please stay tuned for similar events.